A year ago, the National Resources Defense Council (NRDC) reported that as a nation, we waste 40% of our food. The average family plays a role in this. Often, we over-buy food or forgot what we have in the fridge and it goes bad. But, we also willingly discard perfectly edible food, and we do it all the time! Think about the last time you made broccoli or cauliflower: chances are, you used the florets, but threw out the stems. Or the last time your family didn’t get around to finishing the salad greens you bought before they started to wilt. Perhaps you got rid of those, too? Do you ever throw out fruits, like apples or bananas, that get soft and brown after a while? When you do this, you’re throwing away nutrition and money (hey, you paid for that broccoli stem!). The goods new is: there are lots of ways that you can actually use veggie stems, wilted greens, over-ripe fruit, and other produce you are used to throwing away. Stir-fry or steam veggie stems: Instead of discarding stems, slice them and include them in a stir-fry, either alone or with other veggies you enjoy. If, for example, you’re using broccoli, then why not use both the stems and the florets? Along with those from cruciferous veggies, stems from leafy greens, like kale, collards, and spinach, are great in stir-fries, too! You can also steam stems like you would other parts of the vegetable. TIP: add stems to stir-fries first; once tender, add in your other vegetables. Also: for thicker stems, like broccoli or cauliflower, make sure to cut the stems into thin pieces, so that they cook quicker. 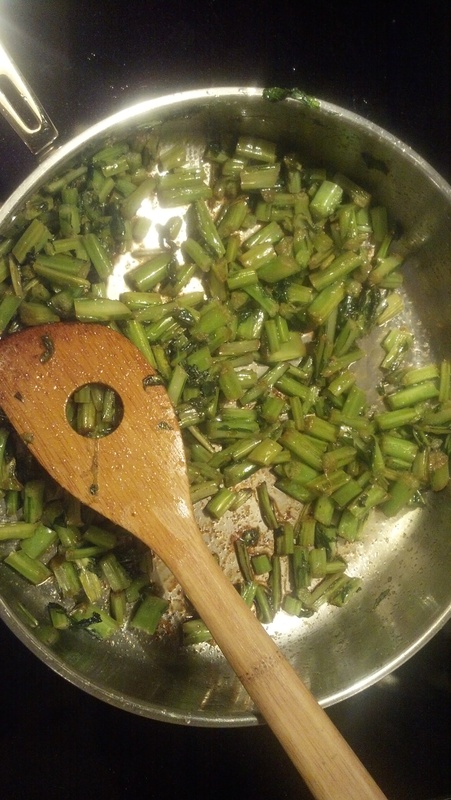 Sauteed kale stems. I added these to quinoa for a yummy meal. Make veggie broth: Keep a Ziploc bag in your fridge or freezer and use it to store parts of vegetables you usually discard: onion ends, carrot tips, herb stems, mushroom stems, parts of any root vegetable, etc. After you’ve collected a bit, use the veggie cuttings to make a tasty broth for your favorite soup! Just throw veggie cuttings into a pot, bring to a boil, and then simmer for an hour or more. Sauté wilted greens: Bought too many salad greens that are starting to wilt? No problem, put them in a pan with some olive oil, add seasoning of your choice (even just salt and pepper is great), sauté for a few minutes, drizzle with lemon juice (optional) and your going-bad-greens are now a tasty wilted-greens side dish! This works with any leafy green: romaine, arugula, spinach, kale, you name it. Make chips: Another tasty treat you can make with your wilted greens is to drizzle them with olive oil, sprinkle seasoning and bake…voila, the healthiest chips you can make! Kale, spinach, swiss chard—any green can be baked into a chip and eaten as a snack, pizza topping, burrito filling, or added into a salad! Freeze for smoothies: If you have fruit that’s getting a little too ripe or soft for your taste (bananas, berries, plums, peaches, nectarines, mangos, etc. ), store them in a closed Ziploc or other container in the freezer and use them to make smoothies. Flavor water or seltzer: Something else to do with fruit that’s getting old and going soft, is to chop it into pieces, add to a pitcher of water or seltzer, and then put in the fridge. After a day or so, you’ll have fruit-flavored water (and by drinking the make-at-home kind, you save yourself about $2 for every 16oz, which is approximately how much Hint and other such fruit-flavored water drinks cost). With these tips you will save money, and enjoy the satisfaction of using what you already have, rather than throwing it away. Categories: Did You Know, Healthy-eating tips | Tags: Food waste, money-saving tips, recipes | Permalink.